I don’t know about you but this whole “April showers brings May flowers” thing is totally out of whack this year. April snow brings May flowers? In addition to a lot of great goodies, Foodie Penpals forces me to reflect at the end of each month, what’s happened and where we’re headed. Normally by now I’d be in spring skirts and flip-flops, but the way things have been, I wonder if I’ll even make it there before the official start of summer. After a depressingly cold winter, we’ve yet to have more than a few days of relief. My first “spring” trip to the greenmarket showed signs of life with a few plants and seed sales, but mostly the cellared remains of last year’s harvest. Spring, where are you? 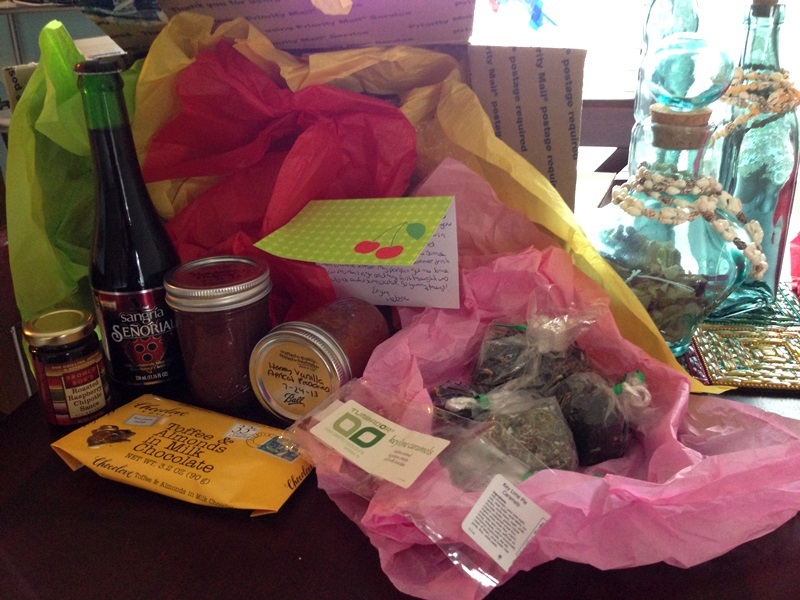 Another month and another fabulous foodie penpal package! This month I was paired with Becca of Two Places at Once. Becca’s blog follows her new live in Texas and journey to figure life out on her own. Her blog is half in the kitchen, half in the depths Texas as she discovers new things. Word to the wise, I think no matter how old you are, you’re still figuring things out on the fly. If you can fake it to you make it, you’re doing just fine. Can you believe it’s practically March, yet here we are, still in another wave of deep freeze? My Foodie Penpal package was late this month, going out and coming in. Not due to anyone in particular’s fault but thanks to good old Mother Nature. For those of you not in the northeast, the day before Valentines Day we were greeted by yet another blizzard. The 4th? 5th? 20th? of the year? To any extend, shopping trips and shipping were delayed. Though as always, when the box arrives on my doorstep, it’s always worth the wait. That’s right, Foodie Penpals is back! First SRC, then Foodie Penpals–things are slowly getting back to normal around here! I skipped September’s Foodie Penpal pairing because we were in the Adirondacks during pretty much the whole pairing/shopping/shipping period. Then in October we moved, then November I forgot, December was canceled, and well, here we are in the new year. I have to say the last few months have been pretty lonely without a care package every month. Sure, the Great Cookie Swap was pretty great, but I didn’t feel like I got to know my penpals all that well because there was no conversation until the cookies arrived. So, you can’t even imagine how excited I am to be back.